I have added a Broadcast method to distribute in guaranteed order a single message to multiple destinations. If one of those destinations is down, message delivery will resume when it becomes available again. If the message cannot be delivered in 24 hours, the the message will get logged to the failed log. The new version of this library also creates send, read and failed log files by minute to assure the files are not too large when there is a very high number of messages flowing. It will also remove the sent and read files after 48 hours, a value you can change in the constructor. If you find it helpful, please give me a shout. If you want a change, shout louder. Today I had occasion to use in a work project the PriorityQueue<T> and Heap code that I had written and blogged about recently. In doing so, I discovered a couple of bugs and fixed them and added tests to cover the issue that was uncovered. Here’s what changed in the PriorityQueue<T>. You can follow the link above to see the change to Heap. If you like it, let me know. I finally got around to fixing the code samples on the ServiceWire wiki on GitHub. If you don’t know what ServiceWire is, please check it out and give it a try—download the NuGet package today. Be sure to read how easy it is to use on the Getting Started page. I’d love to hear from you. Like it? Hate it? Want it to do something it doesn’t do? If you have worked in the software development world long enough, it has likely been your privilege (tongue firmly in cheek) to work on a project and with a team that has been taken to or even driven over the brink of failure. A project like this usually involves an unhappy client, a frustrated management and a very discouraged delivery team. It generally involves an “interrupt-driven” task and workflow prioritization process with a fixed delivery schedule, a once fixed but changing requirements set, and estimates and assumptions that failed to consider the full lifecycle of a feature, story, or task. Often such projects are cancelled and teams dismantled. Sometimes they push through to a bitter end with something that works but everyone unhappy. It took too long. It cost too much. It works but not well. Clients are lost. Teams suffer from unnecessary attrition. Blame and resentment prevail. But there is a better way. Teams and projects can be rescued. To rescue a distressed project and team is not as hard as one might think. Many have written about this. Some of us have even experienced it first hand. 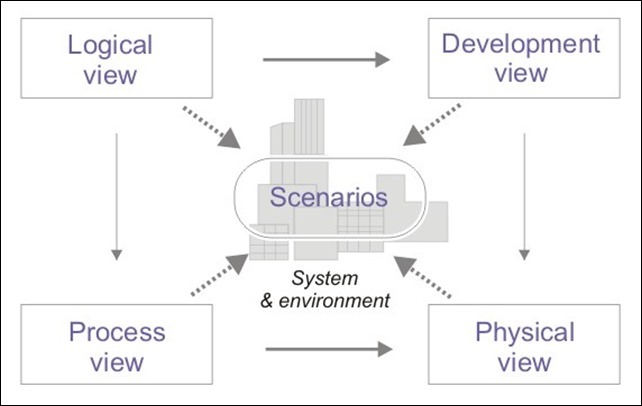 One excellent case study was published two years ago by Steve Andrews on InfoQ. There are many other stories like the one he shares and they all have several common aspects that can come to your rescue. Working from facts and data, such as defect counts and other available metrics, can help to eliminate the emotional element and engage the team’s analytical talents. Make quality and testing come first. Create acceptance tests for a given feature or story before you begin coding. Acceptance tests should clearly define “done” and support validation. Long established principles of quality manufacturing, these can be applied to software development. Creating very large and complex requirements documents that will be invalidated shortly after development begins is waste. Managers pushing large sets of tasks and assigning specific work items to specific team members creates waste. “Fix all the bugs” creates a batch that may overwhelm any team. But when team members pull work from a queue (aka backlog) and a team’s total work-in-progress (WIP) is limited, individual and team work flows efficiently. Coach teams in Scrum and Kanban and let them choose which works best for them to control flow and achieve individual and team efficiency. Some teams may choose a combination. In any case, self-organized teams pull work and progress more efficiently than those who wait for management to assign out tasks. Management is then free to focus on grooming the backlog. Change control and therefore control of the backlog is critical to the success of a project. A manager with one of any number of titles controls what gets added to the backlog and when. The manager gathers details from stakeholders and delivery team members for each item on the backlog to provide sufficient detail for an estimate to be made. Based on input from stakeholders, the manager prioritizes items. Delivery team members add estimates before items can be taken off the backlog and put into a ready state or work-in-progress state. Estimates can be in abstract “points” or “ideal days” or some other common unit of measure to allow tracing metrics as work proceeds. Once estimates are provided, the manager works with stakeholders to finalize backlog priorities. Even if you are not using Kanban, you still need to eliminate bottlenecks and prevent individuals from working too far ahead of the team. If analysts are unable to keep up with writing acceptance tests, re-task other team members to avoid starving or bunching up of the team’s work-in-progress. If the delivery team lacks a well groomed and ready backlog, you should alter your planning cadence, decoupling it from your delivery cadence. The primary factor in rescuing a distressed project and team is the motivation of management. If you believe in your people and give them the tools, processes and coaching they need to achieve great things, you can turn around a troubled project and team. Continuing with my C# Algorithms series, I’ve just completed a rather lengthy effort to implement and test min and max heap algorithms, including heap sort, along with a priority queue, something not provided by the BCL. While the heap sort is not always the most efficient, the algorithms required to accomplish the sort, specifically the heap data structure functions, supply the requisite functionality to make the implementation of a priority based queue quite easy to implement. This work is a part of my continuing effort to work through all of the common algorithms found in Introduction to Algorithms 3rd Edition, I highly recommend this work to anyone who wishes to study classic computer science algorithms. For me, the exercise of implementing them in C# is a great learning experience. First, let’s look at how it works. You have a job scheduler that needs to execute jobs in order of priority but jobs are enqueued with different priorities but need to be dequeued according to that priority. Here’s the Job class. Note the implementation of the MinValue and MaxValue which is needed for the heap based ordering required after a dequeue. And now here’s the test code that demonstrates the use of PriorityQueue<T> with the Job class. I’m posting the PriorityQueue<T> class here along with the static Heap class that provides the underlying heap structure algorithms. I hope you get some use out of them. And here’s the Heap code. Not light reading. For help in walking through the code, review the unit tests on GitHub. /// max-heap property (data[Parent[index]] >= data[index] where Parent = index / 2). /// min-heap property (data[Parent[index]] <= data[index] where Parent = index / 2). /// such that data[Parent[index]] >= data[index] where Parent = index / 2. /// Extrax max and re-heapify with decremented heapSize. /// Caller must remember to decrement local heap size. /// Extrax min and re-heapify with decremented heapSize. /// Insert item into max heap. Caller must remember to increment heapSize locally. /// Insert item into min heap. Caller must remember to increment heapSize locally. If you find any flaws, please do let me know. I will be working on improving this library over time, so look for updates and check GitHub for latest code. Enjoy. Recently I needed to assure that a process could not be started for a second time on the same machine. I had done this before with a mutex but rather than rummaging through old code on my own personal machine, I did the expedient thing and found this question on Stack Overflow. I liked the answer as many others did and after a few minutes of tweaking came up with this useful adaptation. I share it here in part to help others but mostly to create a permanent “note to self” as this will surely come up again in the future. If you know of a better way or see any flaws in this one, please do share. 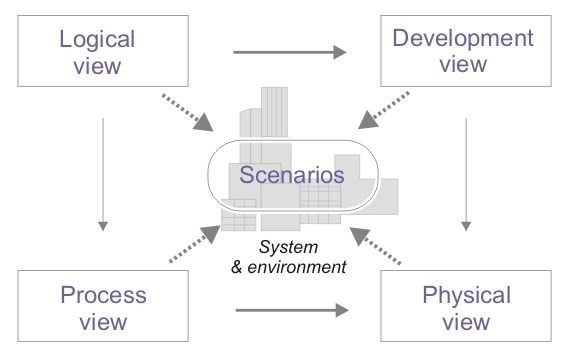 You can find the well written brief on Phillippe Kruchten’s 4+1 architectural view model on Wikipedia along with a link to the original white paper published nearly 20 years ago. Kruchten worked for Rational, as I understand it, and so this is often referred to as the RUP 4+1 model. Although I have used this model or some variant of it at times, I had quite forgotten its name and origin until someone reminded me of it the other day. Of course, we often forget that UML also came out of Rational’s famous Grady Booch, Ivar Jacobson and James Rumbaugh..
And yet today I find it difficult to find software developers who know much of anything about the 4+1 model and only a few regularly use UML and even then only for simple class diagrams. So why the disconnect? Perhaps a Version 2 of these approaches is required. What would you get if you mixed the 4+1 model with more clearly defined non-functional requirement scenarios as I’ve previously discussed and the C4 model presented by Simon Brown along with just a bit more UML that most developers are not currently accustomed to using? I’m thinking this through and will post more thoughts on it soon. Two days ago I posted Non-Functional Requirements for the Software Architect in which I suggested that quality attributes or non-functional requirements could be categorized into a two by two grid, operational and non-operational by internal and external. Thinking further along those lines led me to picture the illustration below and hop out of bed to put it to virtual paper. 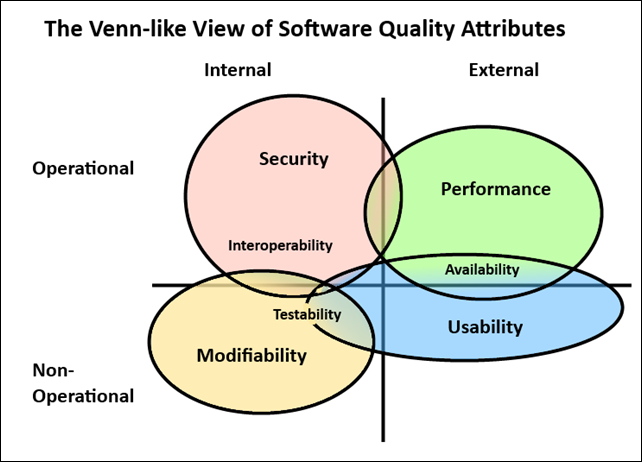 Most quality attributes will fit into one or two of the big four: security, performance, usability and modifiability. And each of these largely corresponds to its depicted quadrant. Security is largely an internal concern. Often external stakeholders will profess their concern with this attribute, and hence the Venn-like spill over into the external quadrant. Generally the concern for security and assuring security falls within the domain of internal stakeholders and the implementation team. External stakeholders are mostly concerned with performance and usability. There are a number of other quality attributes such as availability that fall within or at least are closely related to one or both of those. Modifiability is almost exclusively a concern of internal stakeholders and implementation teams. Interoperability and testability are largely related to modifiability while interoperability nearly always shares at least some security concerns. You may mix these differently to match your circumstances and priorities, but the illustration covers the majority of software development efforts but of course does not spell out the details. For guidance on that, I recommend my previous post. 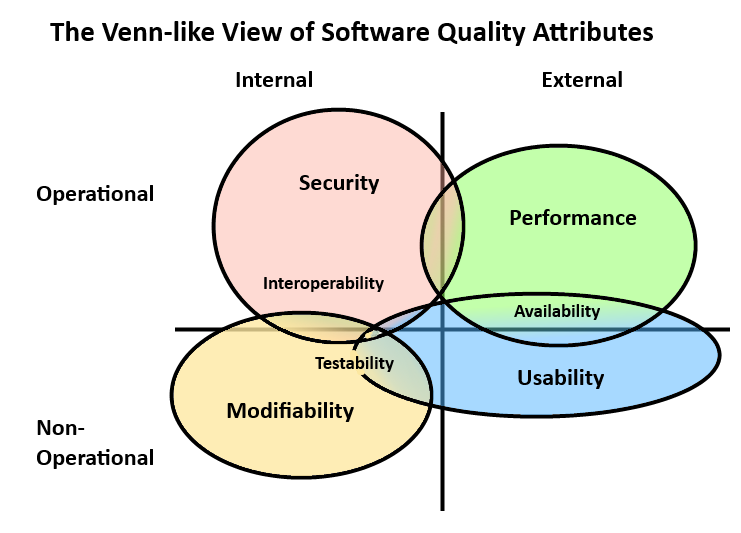 If you are concerned with software architecture, perhaps this will help you to visualize how these quality attributes or non-functional requirements compete and compliment one another. While I am not completely certain that is always the case, it is a principle that is well worth considering when creating and refactoring the architectural elements of your system. And it is my hope that by seeing this illustrated, it will get you thinking about how your own desired quality attributes interact with internal and external teams, which are operational and non-operational, and how they may compete with or compliment on another.